Below is a list of recommended books, songs and documentaries about coal mining and/or the labor movement that are recommended by the United Mine Workers of America. If you would like your work reviewed by the United Mine Workers of America, email journal@umwa.org. 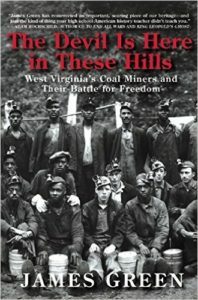 In The Devil is Here in These Hills, Dr. James Green writes about the development of the mining industry in West Virginia, conditions of the coal camps and the West Virginia Mine Wars of the early 20th century. Topics include the Paint Creek and Cabin Creek strikes as well as the Battle of Blair Mountain. Green goes into depth about the master/slave relations of the coal companies with their workers. The miners’ desperation to make a better life for themselves and their families is accurately shown. It also highlights many of the labor leaders who were the thorns in the sides of the mine owners, including Mary Harris “Mother” Jones, Frank Keeney, Eugene V. Debs, Samuel Gompers, and John L. Lewis. The Devil is Here in These Hills tells an important part of the American and labor history that has been forgotten by much of the country. The middle class was not given by employers, it was created by the demands of workers and fought for by men and women across North America. The book is available at Barnes and Noble and amazon.com as a hardcover and ebook. A Strike Like No Other Strike by Richard A. Brisbin, Jr.